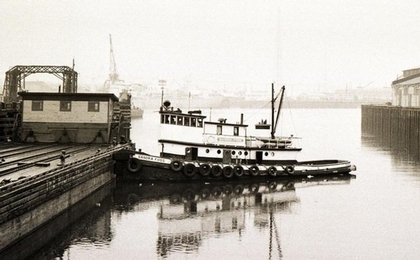 Built in 1925, by Chilman Shipyard Incorporated of Hoquiam, Washington as the Tyee for the Allman Hubble Tugboat Company of Everett, Washington. On December 6th, 1940 the Tyee was caught in ninety mile gale. The tug was swept ashore on the Tillamook Bar near Garibaldi, Oregon. In the aftermath of the storm, the wreck was hauled onto the beach by Astoria, Washington based salvage parties. In 1942, the tug was salvaged, and refurbished by the Foss Launch and Tug Company of Tacoma, Washington. Where she was renamed as the Sandra Foss. In 1974, she was acquired by an individual named Donald J. House of Juneau, Alaska. Where she was renamed as the Tyee. In 1998, the tug sank south of the Agate Pass bridge near Bainbridge Island, Washington. Where the wreck was abandoned. She was a single screw tug, rated at 750 horsepower. Ship Builder: Chilman Shipyard Inc.